So many people inspired this coat, which is why I decided to share. Also, I hope to inspire folks to consider making their own modifications. For me this was a learning experience and I wrote every stitch in the “new pattern” down. I haven’t typed it up and won’t post because this is someone else’s original design that I’ve modified. What I will do share with you my experience and hope you find your own way. The original pattern I started with was Sally Melville’s who is a great teacher and author of the Book The Knitting Experience. 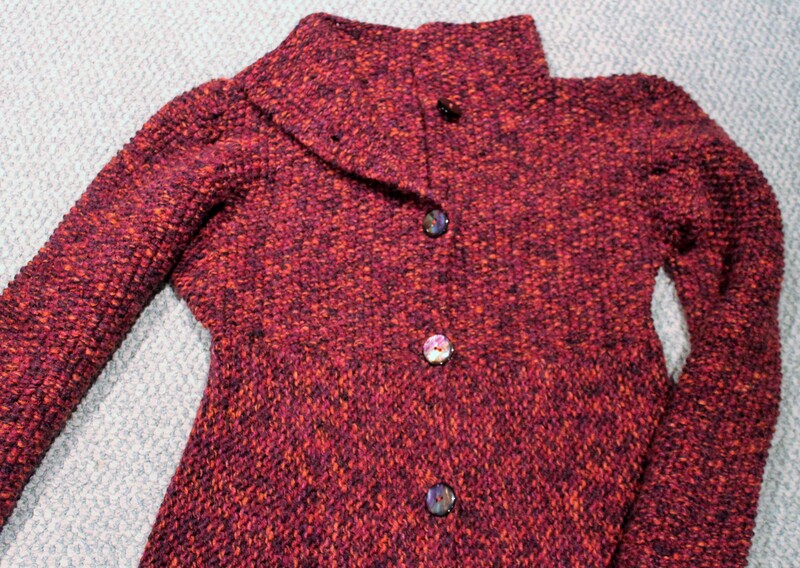 The inspiration to make it fitted was with a Craftsy course with Stefanie Japel, Fit Your Knits. 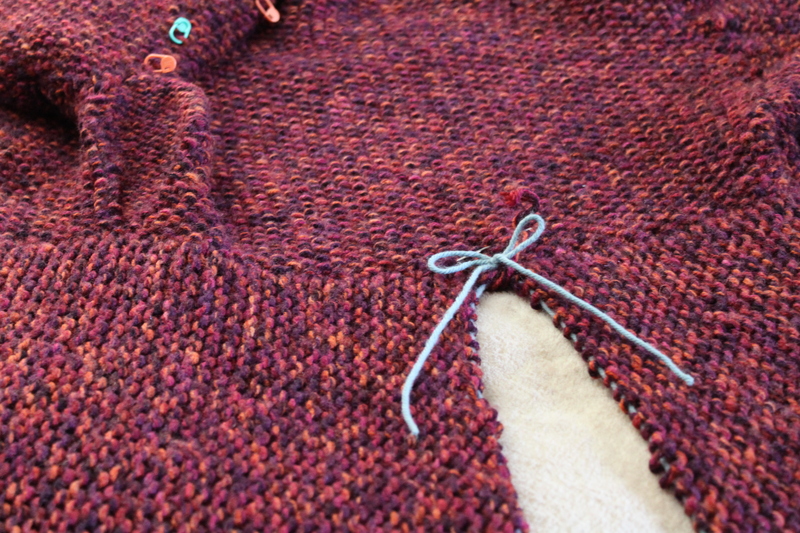 The methods used to make it fit were adding stitches under the arms for the bodice and short rows on the lower portion, the latter inspired by a Craftsy class, Short Rows, with Carol Feller. Thanks to you all! The yarn was a bulky yarn closeout at my nearby Joann’s. It’s their in-house brand called Sensations. The buttons came from my LYS Serial knitters—they have such a lovely selection (of everything)! They had the right number (+1) in the perfect size and color as if they’d planned for me to stop by. They also supplied me with the Knitter’s Pride Dreamz needles in 10 ½ (3 sets) and that’s when I fell in love with wooden circular needles. I took my measures (in my unmentionables), printed out the handout from the class, knit my swatches of the various fabrics and did the math. On to the knitting! Four inch collar picked up at neck edge; fitted waistline. Once completed I donned it immediately. The sleeves were roomy—just right for clothes, but the bottom was perfect only if I wore it nekkid. The button band bulged open especially in my waist and hips. *sigh* I had not allowed for clothing to be worn underneath. “Just wear it open”, my husband says. A heavy coat for chilly days? It just wouldn’t do! 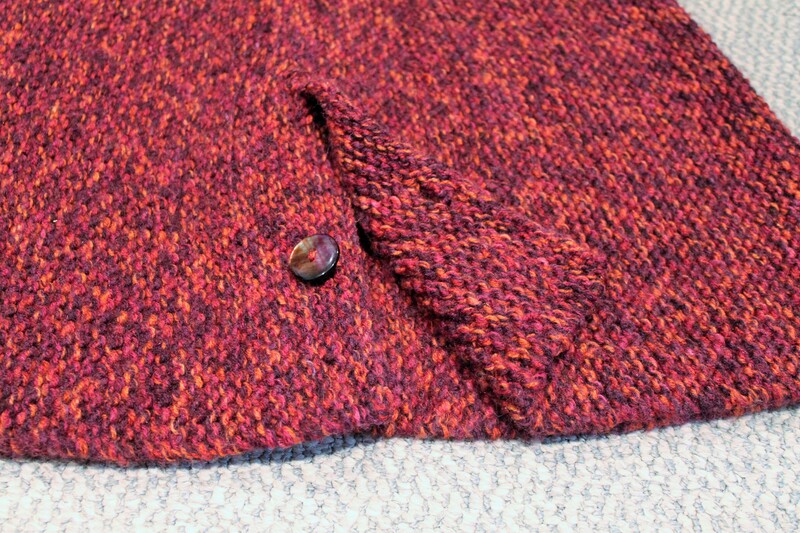 So after frogging the garment for about three months, I decided to cut it up the back (followed shortly thereafter with fainting and lying quietly in a dark room). So much had gone into this pattern alteration so far. I was determined to finish it and make it wearable. Surgery time! Everyone seemed to treat the gash like an up and down problem. In the end I turned it on the side and used the same stitch (garter) and method (short rows) to make it bigger. Less inspired, perhaps, but it gave me the garment I’d originally planned, not a different one. I picked up stitches on both sides with the intent to meet in the middle. It was surprising unnoticeable that I was going a different direction from the original. 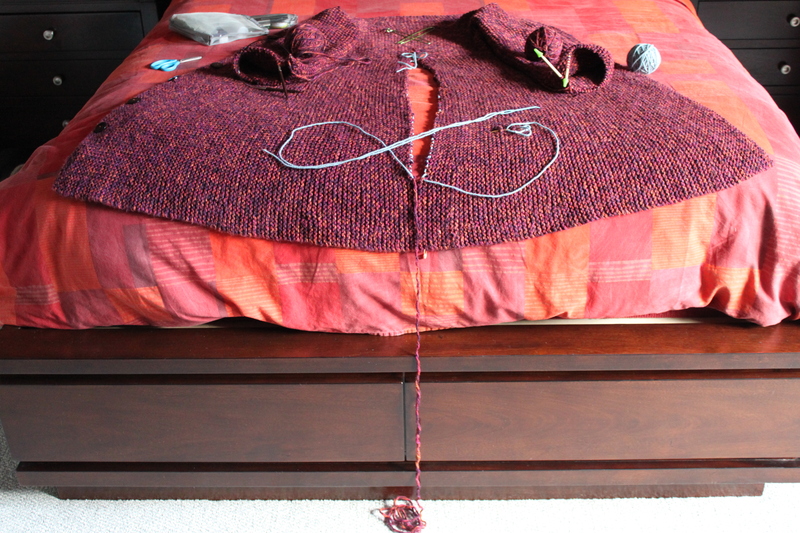 The only issue is that on one side my short rows were WS, not RS. I also had to add the most in the hip region, so the lack of spread (e.g., the zigzag above) made them more noticeable. Thus the ribbon in the back.